Reliance Communications has announced Reliance Rs 9 data pack offer with this users Get 1GB 2G data for prepaid Rs 9 only. Users get 1GB 2G internet data at just 9 rupees only. This is amazing offer is valid selected circles. These data pack will remain valid for just 1 day. 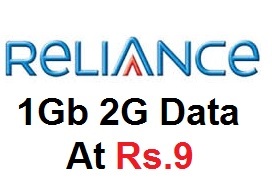 How to Activate Reliance 9 rs data pack? First of all open your dialed paid. Dial *129# from Reliance Sim (Make sure you have prepaid users only). Select (Rs 9 Store) option 2 and click on “Send”. Now, you’ll see the image of this type again. Now type “*” * and Click on “Send”. Again type “* and click on “Send”. Now type “6” (for Rs.9 = 1GB 2G Data) and click on “Send”. Once all steps has complete, Then you will receive Confirmation Via SMS and your selected pack will be activated. Last month Reliance launched new 4G special tariff pack Rs 149 for its customers in Andhra Pradesh circle The special tariff voucher offers unlimited local and STD calling without any cap and is valid for 28 days.